One of the things my mom always taught me, (seriously it has to do with baked ziti) one of the most important things really- is to always make people feel welcome in your home. My dad did a lot of traveling when we lived in Missouri for a few years- and with that also came a lot of people in town on business to our house. You see Gallatin, Missouri had no real restaurants (except for that amazing pizza place where I spent many a Friday night) and so it always fell on my mom to throw together dinner for guests-typically with no advance notice. 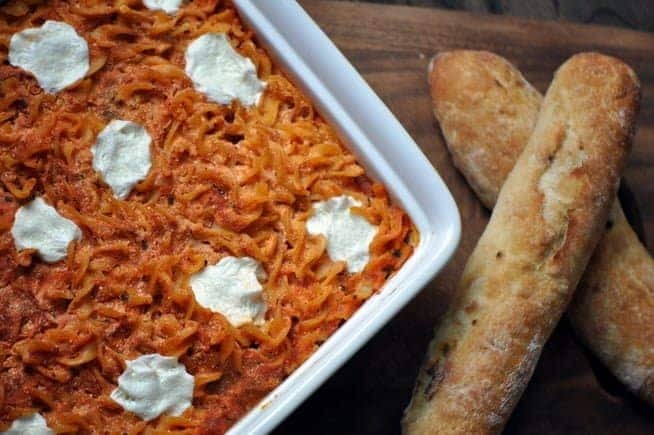 This baked ziti is something I can always picture her putting together and it was a hit. Throw in some meatballs and garlic bread- and you are set for any visitor. The best, well there are many really, part about this meal? You can make it ahead, freeze it, and it’s still fab when you cook it- also, it’s impossible to screw up this “recipe” and you can add in all kinds of things if you want. Consider this your “little black dress” of meals, it works for everything. FYI.. it makes a fabulous baby gift for a new mom. Prepare the pasta as indicated on the package, undercooking it just a little. Drain the hot pasta and pour it back into the warm pot. Stir in the ricotta and one jar of the marinara, mix until it is blended. Toss in a bit of the mozzarella cheese- stir to combine. If you are using the optional add in ingredients, put those in now and stir. In a rectangular pan, pour in just enough marinara to lightly coat the bottom. Top with the pasta/cheese mixture. Sprinkle or place the extra mozzarella on top of the pasta. Cover with aluminum foil and bake for 20-25 minutes or until cheese is bubbling. Serve warm with extra marinara, garlic bread, and salad! Kris Drewry is a freelance host on several nationally broadcast networks. Her first book, Breakup Positive, was published in February 2018.